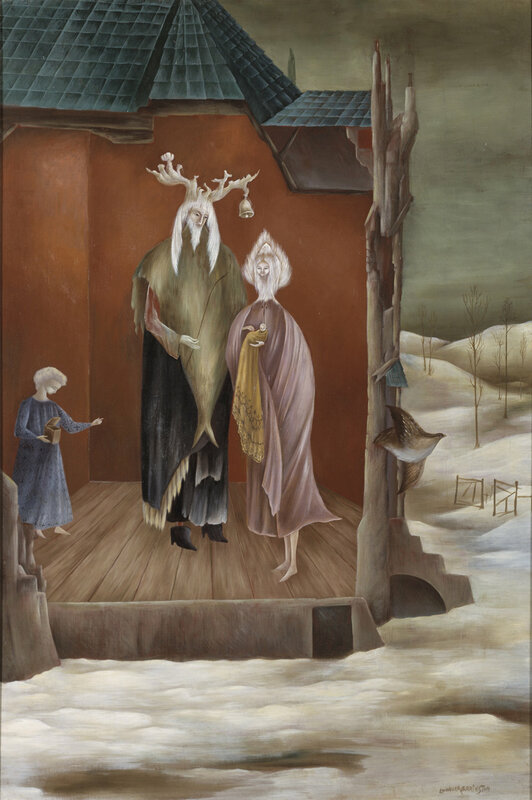 Leonora Carrington, a British-born Mexico émigré, enjoyed a rich and remarkable artistic career spanning nearly seven decades. A pre-eminent artist of the Twentieth Century, Carrington painted, drew, made sculptures and textiles and wrote fiction and plays. She developed deep relationships with seminal artists of her time including Max Ernst, Remedios Varo, André Breton, and Luis Buñuel. Carrington was born April 6, 1917 in Lancashire, England, to an upper-class family. She grew up on a large estate full of wild flora and fauna, enjoying the whimsical folkloric tales recanted by her Irish grandmother and nanny. She was expelled routinely from Catholic schools due to her eccentric behavior which stemmed from her interests in the occult. Carrington was nevertheless presented as a debutante at the court of George V and, against her father’s wishes, attended art school at the Ozenfant Academy in London, founded by the eponymously named French Modernist. At a dinner party in London, Carrington met Max Ernst, an event that changed the course of her life. At the age of 20, she moved to Paris to live with Ernst where she began her education in earnest. There, she joined the Surrealists, becoming acquainted with Picasso, Dalí, Tanguy, Miró and many others. Carrington’s style became recognizable worldwide, a combination of anthropomorphic whimsy and an undercurrent of shadowy darkness. She rejected the “Surrealist” label; insisting that she painted the world in the way by which she observed it, somewhere in the corporeal and subconscious. With the outbreak of World War II, Ernst was imprisoned first by the French and then by the Germans, and Carrington suffered a breakdown which led her to a mental hospital Spain. Her illustrated memoir of this time Down Below, chillingly and fantastically chronicles the abusive Cardiazol-induced treatment she endured. Carrington physically escapes Europe and the financially-fueled oppression of her parents, stopping in New York en route to Mexico. She has a solo exhibition at Pierre Matisse Gallery and is including in important groups shows at Peggy Guggenheims’ Art of This Century Gallery and the Museum of Modern Art in New York. In 1943, Carrington moves to Mexico City where she meets many of the European émigrés from the war, including the Hungarian photographer Emerico “Chiki” Weisz, who notoriously worked with Robert Capa and escaped Europe with suitcases filled with negatives and Capa’s indelible war images. Carrington and Weisz marry and have two sons. Carrington painted and wrote energetically in Mexico, inspired by her children and the country’s rich pre-Hispanic civilizations and the mythologies and occult knowledge of the cultures around the world. Carrington’s renowned The Magical World of the Maya was commissioned in the early 1960s by the National Museum of Anthropology, where it remains today. It is estimated that Carrington produced 1,500-2,000 artworks over the course of her lifetime. She explored themes of alchemy, spiritualism, mythology, nature, the Kabala and the teachings of Popol Vuh and Gurdjieff and Ouspensky. Carrington’s artwork is as enigmatic to her as to her audiences. It re-imagines worlds only known to her; a singular vision blending fantasy, feminism, religion, and magic, all borne out of a life well-lived. In 2005, Carrington was awarded Mexico’s National Prize of Sciences and Arts, reserved for the country’s most admired artists. Since Carrington’s death in 2011, her work has been the subject of major museum exhibitions including, Leonora Carrington (2015) at the Tate Liverpool, and The Celtic Surrealist (2014) at the Irish Museum of Modern Art. Her work has also been prominently featured in In Wonderland: The Surrealist Adventures of Women Artists in Mexico and the United States (2012) at Los Angeles County Art Museum and The Colour of My Dreams: The Surrealist Revolution in Art(2011) at Vancouver Art Gallery. Most recently, the Museum of Modern Art in Mexico City and the Museum of Contemporary Art in Monterrey in collaboration with the Museo de Palacio de Bellas Artes presented the most comprehensive exhibition for Leonora Carrington to date: Leonora Carrington, Magical Tales (2018-19) accompanied by a 500 page catalogue. 500 page catalog in conjunction with Leonora Carrington’s significant traveling retrospective Magical Tales at the Museo de Arte Moderno, Mexico City, Mexico and Museo de Arte Contemporáneo de Monterrey, Monterrey, Mexico in partnership with Palacio de Bellas Artes, Mexico City, Mexico. With essays by exhibition curators Tres Arcq and Stefan van Raay in addition to Withney Chadwick, Salomon Grimberg, Jaime Moreno Villarreal, Mariosol Argüeles, Terri Geis, Susan L. Aberth, Gabriel Weisz Carrinton, Marina Warner, Francisco PEredo Castro, Joanne Pottlitzer, Gloria Orenstein, Arturo López Rodríguez. This book has a print-run of 500 copies. 60 page catalog with essay by Ara Merjian, Stanford scholar who is currently teaching at Harvard and NYU and literary interpretation by Gabriel Weisz-Carrington, Leonora’s son.